This post is sponsored by DaySpring. All opinions are and will always be my own. Some of the links below may be affiliate links. When you click on those links, I will receive a small commission which helps me continue to run this blog. I appreciate it! You can find my UNBOXING VIDEO over on my YouTube channel. If you aren’t familiar with these kits, they are a monthly devotional kit put out by Dayspring and Illustrated Faith. Each month they have a different member of the faith community write the devotional and create the artwork for the kit. I was only recently introduced to Melisa Garcia through this kit, but have followed her on Instagram and she is such an inspiration! I really do love each monthly kit that Illustrated Faith releases, but I have to say this is a favorite of mine. The florals and the colors are exactly my style. As beautiful as this kit is though, I think it’s the devotional that really shines this month! It is really speaking right to my heart! Are you ready to discover who you are in Christ?! There is so much more goodness in this kit and I would encourage you to pick up one for yourself. I would love to see your entries, so be sure and use the hashtag #IF_IAM this month so we can connect. 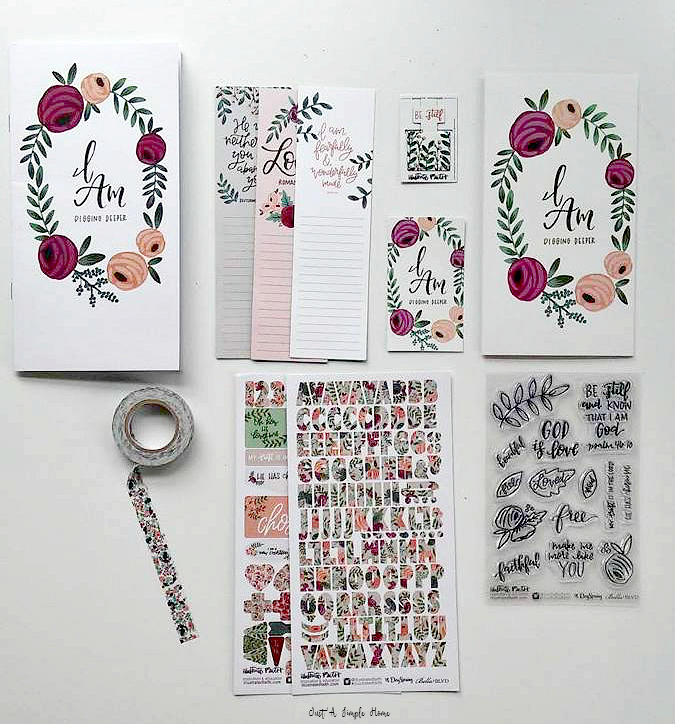 You can find the kit HERE and also be sure to head on over and check out my UNBOXING VIDEO to get a closer look at the beautiful items that are included. I will be sharing my journey through this devotional and more goodness over on my YouTube channel, so be sure to subscribe and join me! I agree, this kit is particularly beautiful! I love how Dayspring goes above and beyond to inspire you in all the little ways. I agree, it’s amazing to be part of! I love this! I have been thinking about jumping on the subscription box bandwagon, but haven’t yet because there are so many options and some I may not really use. However, this is one that I would definitely use and I love that I get introduced to new devotionals and authors every month. You know, I have never not liked one of their kits, but…the great thing about theirs is it’s actually NOT a subscription. Each month, when the new kit is released, you just go on an decode if you want to order that month’s kit. You aren’t locked in to a subscription, which I appreciate. You should grab this month and do it with me! Wow this is beautiful. I love the short and sweet messages. This is really, really pretty! I loved watching your YouTube video of the unboxing. I have yet to order a subscription box, but I really like this one! I’ve never heard of these before but they are gorgeous and such a great idea!! These are absolutely beautiful. I’ve never heard of them before, but definitely interested now. Thank you for this! loved this!! Your writing is great! I love that this box is inspirational! 🙂 Plus that stationary is so pretty! This is a beautiful set. Thanks for sharing it!